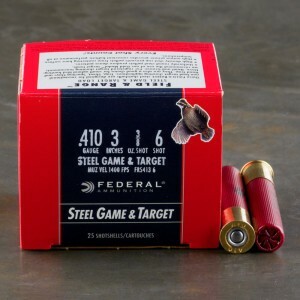 410 steel ammo is growing in demand as the use of non-toxic steel shot is on the rise. It has come about due to concerns that lead shot is toxic particularly to waterfowl. The birds allegedly ingest the lead while bottom feeding and develop lead poisoning. 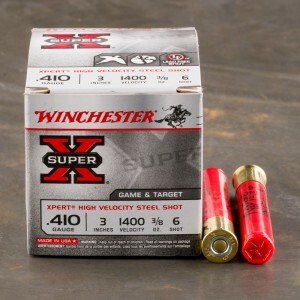 Furthermore, there are some concerns about human health while handling the lead components of shells and shotshells. The biggest downside of using steel shot is that lead is over 40% denser than steel (11.3 g/cm3 compared to 7.9 g/cm3). This increased density gives lead shot greater range and penetration ability. 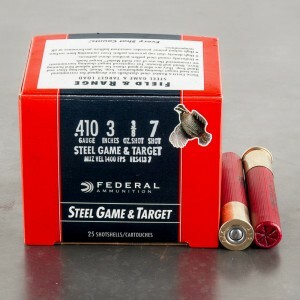 The hunter needs to remember the difference between lead and steel when considering the target in question; the hunter may need to pass on some of the more distant and larger targets when using steel shot. There are numerous factory offerings loaded with non-toxic steel shot.